Photo: Proud moment as Dwayne “The Rock” Johnson is bestowed Seiuli title by the Head of State, His Highness Malietoa Tanumafili II, yesterday in a ceremony at Fa’atoialemanu. From left: The Rock’s mother, Ata; His Highness Malietoa Tanumafili II; and the new Seiuli Dwayne “The Rock” Johnson. Dwayne “The Rock” Johnson was yesterday bestowed the esteemed orator title Seiuli by His Highness the Head of State, Malietoa Tanumafili II. “From today onwards you will no longer be known as Dwayne, but will carry the title Seiuli, the son of Malietoa (Alo o Malietoa). 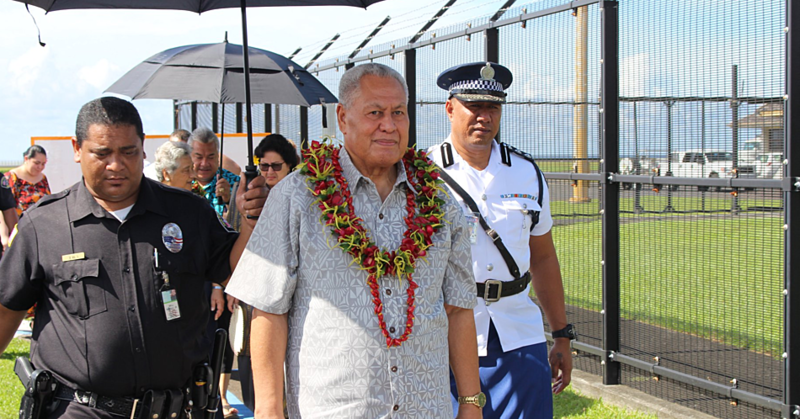 The ceremony was held at the Head of State’s residence at Fa’atoialemanu. His meeting fale was filled with the Sa Malietoa clan, district chiefly delegations and well wishers. Sporting a plaited white shirt and black ie faitaga. The Rock was accompanied there by his mother Ata Maivia and his visit’s coordinator, Afimutasi Gus Hannemann. The ava ceremony, as it is with protocol, was hosted by the Sa Malietoa family. In accepting his ava, the new Seiuli said he was overwhelmed by the honour that has been given him. “I promise that I will carry the Seiuli title with pride, dignity and honour,” the famous actor-wrestler son of Samoa said. 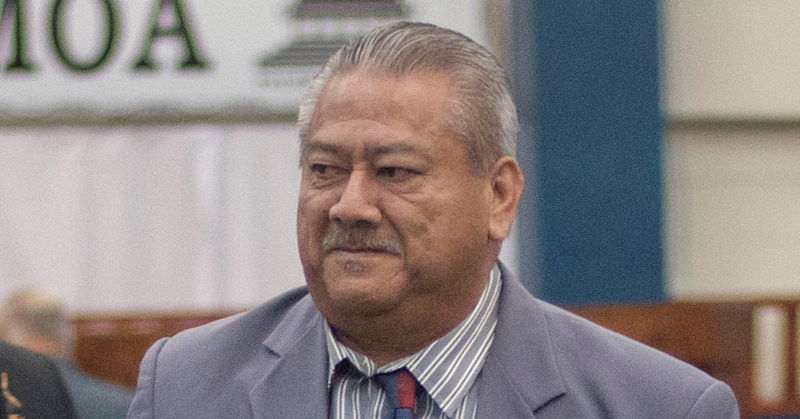 Seiuli said that though he was not born here, he always identified himself as a true Samoan. “This is my home, my people, my culture,” he said. Representing the Government at the ceremony yesterday was Deputy Prime Minister Misa Telefoni. In the bestowing of the title, The Rock kneeled before His Highness with his hands resting on the Head of State’s shoulders. The two exchanged a few quiet words, with the Head of State giving Seiuli his blessings. Fine mats were exchanged afterwards and Seiuli The Rock gave $10,000 to the Head of State. As a personal gift, he also gave His Highness a replica of his wedding ring. The ring has traditional Samoan designs engraved on it. Speaking to reporters outside, Seiuli The Rock said that he has truly been humbled by the occasion. “It’s such a powerful, overwhelming experience,” he said. Seiuli The Rock admitted that this was perhaps the first time he had ever worn an ie faitaga. Seiuli The Rock was last night hosting the 250-tala-per-head fundraising dinner gala at the National University of Samoa fale at Le Papaigalagala. 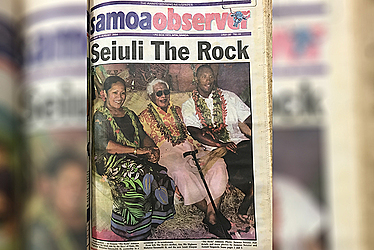 Proceeds were to be presented by Seiuli The Rock to the Little Sisters of the Poor to assist in the upkeep of the Mapuifagalele Home for the elderly they run. 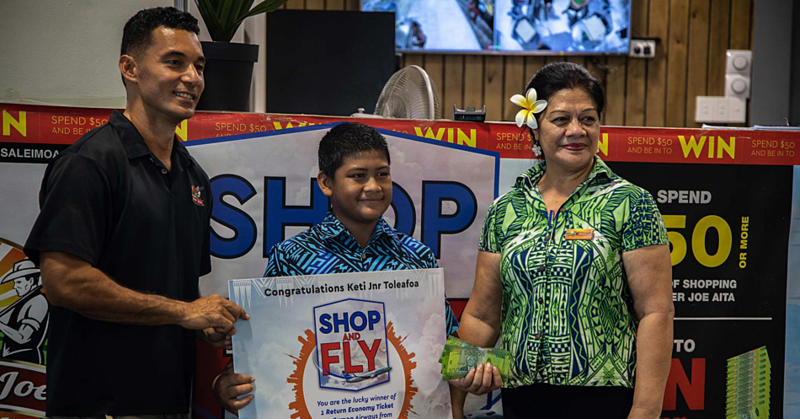 The lineup of entertainment was expected to include Adeaze, Lapi Mariner, Sarah-Jane Auva’a, Dave Parker, the two finalists of the My Idol contest and others. Tomorrow Seiuli The Rock makes a public appearance 6.30pm – 7.30pm at Government Building. It is one of the highlights of his visit from America to the land of his mother and grandparents. He was last here as a boy.